Zhaozhou Congshen (778-897, 10th gen) was a disciple of Nanquan (748-835), who was a disciple of Mazu (709-88). A monastic said to Zhaozhou, "The stone bridge of Zhaozhou is widely renowned, but coming here I find only a set of steppingstones." Zhaozhou said, "You see only the steppingstones and do not see the stone bridge." The monastic said, "What is the stone bridge?" Zhaozhou said, "It lets donkeys cross over and horses cross over." But his path was high. You should catch a giant turtle. A mere waste of labor. One goes into the ocean looking to hook a giant tortoise. Though able to say "whistling arrow," his effort was in vain. This monk tried to test Zhaozhou's ability. Zhaozhou finally says, "It lets asses cross; it lets horses cross." Lay folk as well as clergy, the cat as well as he ladle, you might say. What is the principle of letting asses and horses cross? Whatever you say, you lose your life and get bogged down. Zhaozhou's Zen is lip Zen -- his whole body is a mouth. This is so-called verbal samadhi. "It lets asses cross, it lets horses cross." Animate and inanimate beings cross over at the same time, without hindrance. "If you want to cross the stone bridge," he says in effect, "go ahead," inviting the monk onto the highway of true normalcy. Too bad the monk didn't realize it. There is also an echo in the words; here is where everyone gets out. There were three famous stone bridges of China at that time. 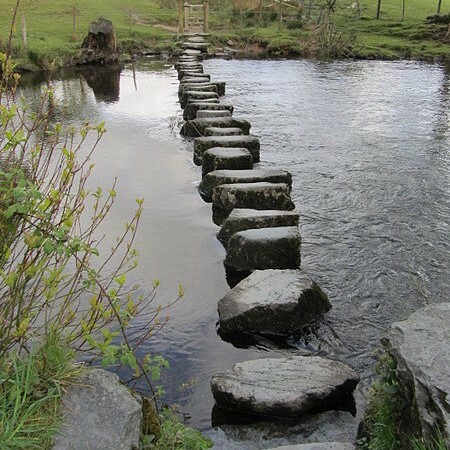 They were not bridges of the kind we are familiar with but a series of rocks placed across a river as steppingstones. The monastic was asking not about the bridge but about Zhaozhou himself. His real meaning was "Zhaozhou is renowned throughout the whole country, but coming here to see him I find only an insignificant-looking monastic." Zhaozhou's reply says the monastic sees only Zhaozhou's external appearance, not the real Zhaozhou. Zhaozhou's follow-up refers to crossing over from one side of a river to the other. The river is the river of samsara (the realm of existence, of birth and death). Donkeys and horses represent all living creatures. Zhaozhou is saying that anyone who comes to him will be led to cross the river of birth and death. Of the three famous stone bridges in different parts of China, one was at the base of Mt. Tiantai, another at Nanyue, the mountain from which Master Nanyue (677-744) received his name. 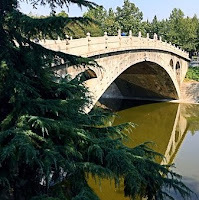 Then there was the stone bridge of Zhaozhou, located about 5 kilometers from the temple or hermitage where Zhaozhou was master. There were two things of note in this locality of Zhaozhou: the stone bridge and the famous Zen master Zhaozhou. Having come from afar to see the famous stone bridge of Zhaozhou (that is, to see Zen master Zhaozhou), what does the monastic find but simple steppingstones. He says, in effect, "Having heard about the famous Zhaozhou, I came here expecting to find an outstanding Zen master and what do I find but a tottering old monastic?" Zhaozhou's reply indicates, "You only see the tottering old monastic and don't see the real Zhaozhou." This monastic jumps at the bait, asking, "What is the stone bridge?" -- i.e., "Where is the real stone bridge? Where is the real Zhaozhou?" Zhaozhou fires back, "It lets donkeys cross, it lets horses cross." One rendering of this puts the accent on Zhaozhou, who lets both donkeys and horses cross according to his will. Another rendering would mean that the donkeys and horses trot across of their own will without Zhaozhou doing anything about it. The stone bridge is the essential world or the true fact. It is across this bridge of emptiness that horses and donkeys pass. People and cars can pass, too. The sun and the moon and the stars pass overhead. The seasons pass in succession. On the stone bridge of the essential, the true fact flourishes and decays in a never-ending cycle. In the world of human society we are born, grow old and die and other children are born into the world. A never-ending cycle of birth and death. This is what is happening at the stone bridge. 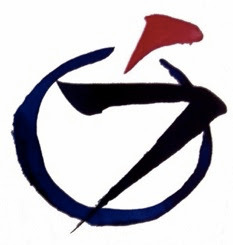 To be a Zen Buddhist is to belong to the least exclusive club in the world; anybody can come in. Zhaozhou said: "It lets asses cross, it lets horses cross." Anyone can cross the bridge, just as anyone can pass through the gateless barrier -- it's wide open. The paradox is that we don't let ourselves in. The barrier is the very idea that there is an inside and an outside, that there is somewhere to go and there is something to get. As long as we make that distinction, we don't realize we're already inside. We spend our nose pressed up against an imaginary windowpane, wishing we were on the other side. Our life already includes everything. Zhaozhou says, the thing you're not seeing is non-discrimination itself, not making any distinction between between wood and stone, between horses and asses, dogs and buddha-nature. We think we have to choose between being selfish and selfless, between love that is personal and unique and a love that is spiritual and universal. On one side of that bridge, in our ordinary life, we think that love is what we need, and we organize our life around the lack of love or pursuit of love. On the other side, instead of a personal, unique love, we try to pursue a universal compassion for all beings indiscriminately. But people can't live on that side of the equation exclusively either. It's hard to build a bridge that is wide enough for both passion and compassion to cross side by side. but there's only one log felled over the stream. the log extends through the clouds. neither profane nor sacred will come. People of power don't come by twos and threes. And swim the white surf through which no one can see. with sore legs and an aching back. are almost too faint to be called stars. Is it sluggish or simply meandering? a pair of ducks glides downstream. One step, one stone, one step, one stone.